When Dib wakes up one cold, depressing morning to find that ZIM is actually his brother, could things get any worse? 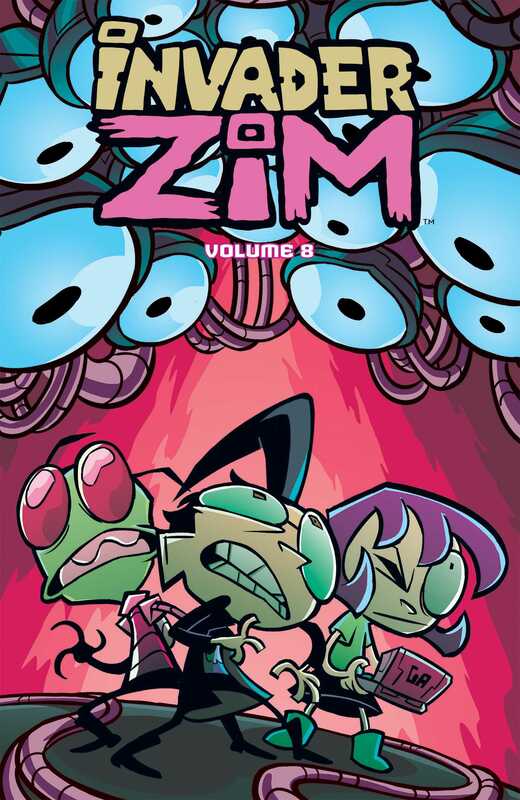 The answer, as always, is yes, as told in these five amazing standalone Invader ZIM stories collected in trade for the first time! What happens when GIR gets hit by a falling girder in the presence of a full human audience? Who’s telling the truth when an alien kidnaps Dib, Gaz, ZIM, and GIR to find out who destroyed his prize robot? And why does ZIM think it’s perfectly normal to give out raw steaks on Halloween? The answer, as always, is yes! Kate Sherron is an artist, designer, and comic book writer from whose comics credits include The Amazing World of Gumball, Adventure Time, Rugrats, Labyrinth: A Discovery Adventure, and, of course, Invader ZIM. Kate also wrangles hellbeasts in an amateur capacity and lives in St. Louis, MO.